Discussion in 'The Hornets' Nest - Watford Chat' started by wfc78, Aug 14, 2012. Blimey - cup double is on! St Albans in the semis - they'll probably charge £10/12 to see our Under 18s. Talking of Jayden Bennetts. He was recently over in Nigeria with the U20 training squad preparing for the U20 African Cup of Nations, but hasn't made the final 21-man cut. It wasn't because he didn't "make the cut" - it's because we'd only ever given him permission to attend the training for one week because we wanted him back for the FA Youth Cup game vs Southampton. Supposedly him not attending the full training week meant that he did not undergo a required medical with the Nigeria team which they needed to certify him as fit to play for the full tournament (tbh, that sounds like an excuse from the Nigerian FA as Watford just aren't keen to lose him for a full month). Not sure how the Nigerian National U20 management team can have possibly expected that we would allow him to miss such a vital game just to play in their Mickey Mouse international tournament. There have been a few stories on Nigerian sites since Bennetts returned for the Southampton game, even suggesting the player couldn't cope with the physical aspect of the training and asked to come home to sort out club issues. Some have said it was Watford not wanting to lose him for the month for the tournament while others have stated the reason you gave, not being there to have the required medical to be included. Either way, he was in the training squad and was then left out of the final 21 man squad. January 16; he's back for the Southampton game but that doesn't mean he'll be left out of the squad. January 16; doubts about Bennetts coping with training. January 22; Nigeria U20 squad announced, Bennetts omitted. It would be surprising if he wasn't up to it, considering the only other players in the squad who play outside of Nigeria are from clubs in the illustrious leagues of Norway, Denmark and Israel. It's difficult to gauge a players ability with the leagues they play in at age level, in my opinion. Also, if those players in the leagues you've mentioned are at the higher age bracket of this U20 squad, then I'd say they've experienced a better quality (more demanding?) type of football than the Watford U18s and the occasional U23 game that Bennetts has played in. I went to the Southampton match & stood pitch side for the 1st-half and I was impressed by his physique, especially his upper body, so I'd be surprised if he found the sessions physically tough. Maybe mentally he found it difficult, being away from 'home' and in a different environment? I offer up the differing reasons/reports because it isn't 100% clear as to why he isn't in the final squad. There are more easy to believe reasons, such as not having the medical, but we don't know. It's a shame because there are a lot of plus points with going away and playing tournaments, as much for growing as a person than a footballer, but it's not to be this time. He's still only 17 so hopefully now he's had a taste of what it's all about, it'll drive him on to be included in future squads. Under 18s lost 3/2 on penalties after a 1-1 draw at St Albans . Just the Youth Cup to play for now . Ryan Cassidy got the Watford goal . I wondered who'd play up front with Cassidy now Folivi is out on loan and it turned out to be... a trialist! A second trialist was also on the bench. Along with having to partner a trialist upfront, Cassidy only got back this morning from a training camp with the Republic of Ireland U19's so not ideal preparation for a semi-final. The triallist who took one of our penalties (came on so presumably the second triallist you mentioned) is named as 'Bani' on the Snorbens twitter feed. Any ideas? In the previous round (22 January) an Alkeo Bani scored a penalty in that shoot-out. A quick search has him as a Fleetwood Town U18 player, previously attached to QPR, and of Albanian family descent though born in England. The Fleetwood link is not via that clubs website, just independent sites listing him to them. I can't find him on their site (at the moment - I'm having a look though). So, yeah. Definitely playing at Fleetwood up to the end of 2018. A defender and/or a midfielder by the look of it. He was at the QPR College Academy for 16-18y/o's. Unless there are other Alkeo Bani's out there I think that's him in the links and short of getting his phone number, I think that's enough on the lad for now. *also, I think I may have a problem! Sonny Blu Lo-Everton made his Scottish U17 debut on 5/2/19, substituted at half-time in a friendly against France which ended 0-0. Today against Hungary in another friendly he was again substituted after 45 minutes in a 2-1 win for Scotland. 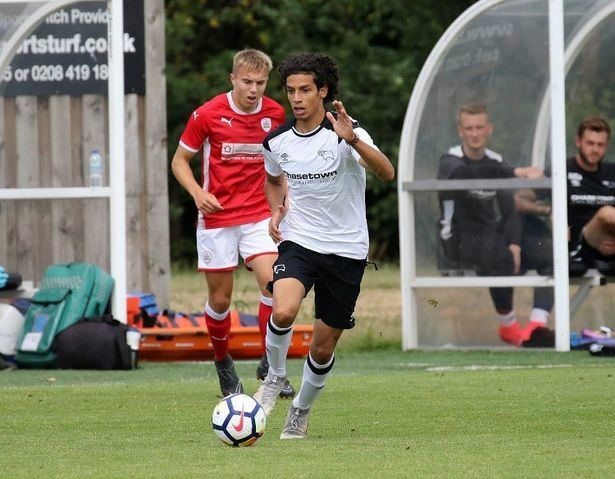 I found out tonight the other trialist from the Herts Senior Cup Semi-Final was Zaid Al-Hussaini and he wore the #7 shirt for anyone who was there. An 18y/o, he signed for Derby County last August on a 1-year deal after previously being part of the FFDTV Academy. (I searched FFDTV Academy on line and life is too short to try and pin down what the hell they're about at 1am and after several Red Rebels). His background was in street football (innit) though Derby did send him out on loan to Gloucester City until December 2018. On most sites after Googling him, he's still listed as being connected to Derby. And yes, it was definitely him playing for Watford. Anyway. For anybody still interested, the two trialists from Wednesday were Zaid Al-Hussaini and Alkeo Bani. EB Hornet, nornironhorn and UEA_Hornet like this. FFDTV appears to be a (south) London-based club/academy principally for unsigned youth players that arrange to have fixtures against the academies of professional clubs with the aim of getting their players spotted and signed by those clubs. They have about 15 fixtures arranged for their "2018/19 season" including against the academies of Derby, QPR, Wolves, Bournemouth and Leicester. Given what they say about themselves and the profile of player that plays/trains with them, I'd guess they have a few scouts keeping an eye on games in London parks looking for any players that stand out who may have for various reasons slipped through the net of other clubs or not yet been seen. I'd also suspect that the best players they find end up being snapped up quite quickly. However, perhaps confusingly, they also have players who at least train with them regularly while also being part of professional club academies - perhaps for kids who live nearby and want to play all the time, even more than is offered via their pro club's academy, or during academy holidays? Players who have spent time playing and training for them include: our very own Domingos Quina, Ryan Sessegnon, Tammy Abraham, Callum Hudson-Odoi, Reiss Nelson, and our kind of very own Jadon Sancho. Dunno what the deal would have been there exactly, given that Sancho was already part of the Watford academy, and studying at Harefield, when this photo was taken, and Nelson was already in Arsenal's academy. He appears to be a pretty two-footed, tricky winger, who, perhaps unsurprisingly given his playing style and ethnic background, says that his idol is Riyad Mahrez. Based on his accent in the interview he is also likely from London. 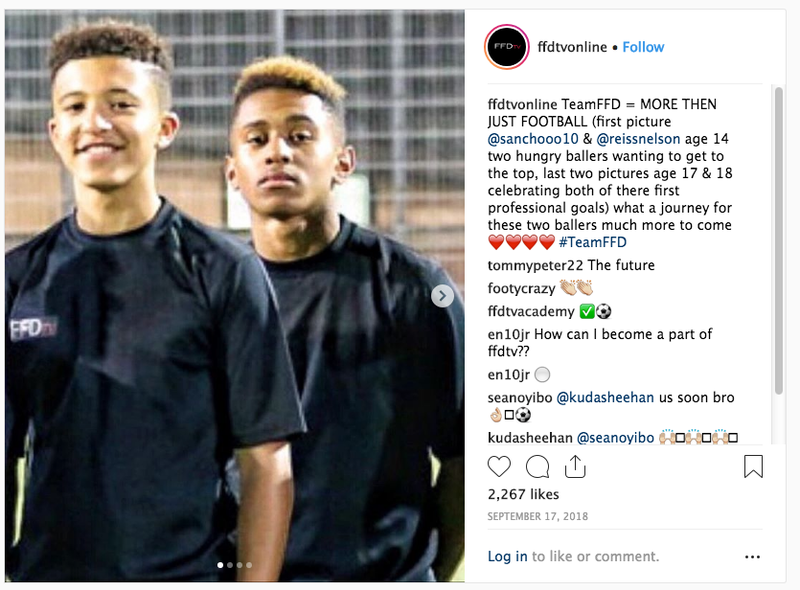 FFDTV is probably a similar deal to that 'Mass Elite Academy' thing which Sam Sesay and Imaad Sankoh, both in our academy, appear to have spent time at prior to us. Still not clear what iti s precisely though. One of our former youth players scored for Swansea (the winner) - George Byers. Today's goal was his first ever! In his sixth appearance, got an 8 out of 10 from the local paper for his MOTM performance! Not great penalties from our youngsters the other night! Smudger and oxhey67 like this. The yoof are 3-1 up at half time against Ipswich in the 5th round of the FA Youth Cup. Won 4-1 and now face Leicester . Ryan Cassidy scored 2 and set 2 up . A penalty and a very well taken goal with a low shot hit across the keeper after being set up by Dan Phillips. Jayden Bennetts scored a cracker from outside the area for the first of the night and then slotted home cooly after being sent through by Cassidy. It was a pretty fine performance by everyone. To a man, the defenders were probably slower than the Town forwards/midfielders but their positioning was so good it didn't matter. The midfield fought and scrapped when Town were on top and played some very nice football when running the game themselves. The forwards were very good too. They harassed the defenders when not in possession and found space well when attacking. At this level Cassidy is head and shoulders above most forwards I've seen (that's not many to be fair). Most of all though, this is a team. They really are together as a group and back each other to a man when things get a bit tasty. Very impressive. wfc4ever, lowerrous and domthehornet like this. I went to the U23 game this afternoon, a 1-4 loss to Charlton Athletic. Quite a few of the players today had played on Tuesday and it showed, with movement of the ball sluggish and their first touch quite often heavy. Full credit to all of them though as they did not stop running or show any lack of effort for the full 90 minutes. It was of course the first game after Darren Sarrl had left the club and there was one noticeable change - Daniel Phillips was captain for the first time instead of Ryan Cassidy. Three trialists were named as substitutes; Zaid Al-Hussaini and Alkeo Bani I recognised while the other had the Christian name Dan. Al-Hussaini, now shorn of his lovely hair, came on but saw little of the ball. He did have one lovely little dribble but looked a little lost out there to be honest. Alkeo Bani didn't play while 'Dan' came on for the last 15/20 minutes or so and initially looked very assured in the middle of the park. A tall, solid looking fella but his game went the way of the rest of the side quite quickly. A word about the two keepers today for Watford. Adam Parkes didn't have a lot to do despite conceding four. I couldn't see that he could've done much for the first 3 goals and he produced a couple of decent close range stops due to good positioning. Just the one blemish when he & right-back Ryan MacLean didn't communicate a far post cross which lead to the 4th very late on. Sub keeper for the day Dante Baptiste must have the largest pair of testicles this side of Viz because he walks with an extraordinary gait. Watfords goal was a sweetly struck Harry Forster effort from outside of the area. The U18s play their FA Youth Cup quarter final tonight away to Leicester, k/o 7pm. 11 | GOAL | Ryan Cassidy has just won and then converted a penalty to put #watfordfc one-nil up in this FA Youth Cup quarter-final. That's his fifth in two and a bit #FAYouthCup games. Who needs Anfield?! This one is. Hornets 1-0 up. Well done Under 18s - through to the semis. Dante Baptiste played brilliantly in nets as did Ryan Cassidy. Looked dead on their feet from about 70 mins to 90 mins but got a second wind in extra time! An outstanding display - soaked up everything a much bigger Leicester side could throw at them. Goalkeeper Baptiste made some excellent saves - he and Cassidy stood out. The game took the shape of the previous rounds with WFC soaking up pressure before playing impressive passing football either around or through the oppositions midfield and defence. Particularly impressed with the defensive unit and how they generally stayed on their feet when Leicester ran at them, especially the longer the game went on and bodies & minds would've been so tired. Great discipline. Not a bad performance by anyone and I thought Emmanuel Adebiyi was excellent in midfield. It’s hard to imagine anyone could top Sonny Blu Lo-Everton as a footballer’s name (sorry Jazzy Barnum-Bobb) but Leicester might have managed it with the glorious Dempsey Arlott-John! Great result for the lads, anyway. So the senior and junior sides could both get to the FA Cup semi final this season!! One down, one to go.